Fringes of Algo » Boards » Creative Corner » Artwork » Featured Images » Phantasy Star Complete Collection: Wata! Phantasy Star Complete Collection: Wata! Post subject: Phantasy Star Complete Collection: Wata! 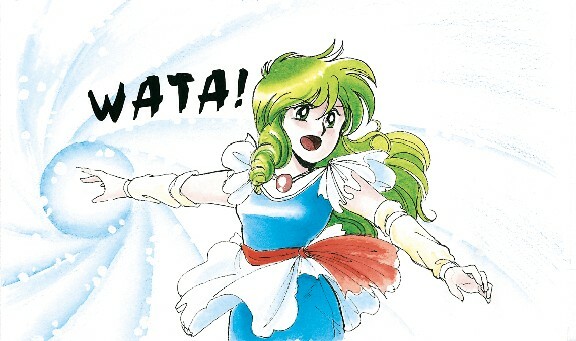 Thea's only appearance in official artwork from the Phantasy Star III manual finds her bringing the power of the Wata technique to bear. This is a side we don't normally see from the quiet princess of Shusoran. She gives the impression of being a very fierce opponent in battle. The name of the technique shown here is a bit confusing. It would seem to be the water technique called Tsu in the English release. The name Tsu was used for energy based attacks in Phantasy Star II and Phantasy Star IV, with Wat being the name of the water technique in the latter. Wata may be an attempt at romanizing the Japanese name of Wat, which appeared as Barta in Phantasy Star Online. See? Confusing. Post subject: Re: Phantasy Star Complete Collection: Wata! Thea art seems quite rare doesn't it? It's a shame because I like her. Ayn: Don't you mean "Tsu?" Thea: No, silly! Tsu's the lightning one! Wata means "cold!" Mieu: Wasn't it called Wat a thousand years ago? Thea: I think it was called Barta. Sari: Oh, whatever. At least Res is still called Res. - PSIII (US:Tsu) should be "Wata" (US:Wat) as stated. Tsu, on the other hand, was Mieu's Skill "Grantsu" (Grantz). Grantz (the technique, not the skill) was named "Tsu" on the English release of PSII and PSIV (in Japan is called called Grantz, GiGrantz, NaGrantz). In short, we have two powers named "Grantz": Grantz (Technique) and Grantz (Skill). - PSIII (US:Forsa) should be "Unbalance" (because PSII:Forsa is a completely different thing) as well as PSIII (US:Deban) should be "Night" (because PSII&IV Deban is also a completely different thing). PSIII (US:Rimit) should be "Noon" (because "Rimit" is a completely different thing). - PSIII (US:Fanbi) should be "Law" (US:Shift) and PSIII (US:NaSak) should be "Balance" or, at least, only "Sak" like PS2:US. This could also apply to PSIV: "Shunera" (PSIV US:Saner) should be only "Ner", like in PSIIUS and PSIIIUS. And finally, PSIV (US:Seals) should be "Shiza", to maintain consistence with PSIIUS, since both are the "Sealis" (Shizasu) technique. I appreciate the PSIII localization team wanting to reuse technique names from PSII, but in some of those cases I really wish they hadn't. The only thing I can keep straight in that game is Res and Anti. Lol, yeah, Thea looks like she has her feathers ruffled over something here and she's not happy about it at all. Good artwork for her though. Very good artwork of Thea indeed ! It seems to be extremely rare to have pictures of this character so..well done ! And NEWSBLADE : thanks for the precisions ! It'n not easy to cath all after the first read ..but that's very interesting ! myau56 wrote: Very good artwork of Thea indeed ! It seems to be extremely rare to have pictures of this character so..well done ! Note: I called Miew's Grantz a skill but it seems to be a technique. Both Grantz are techniques, but Miew's is a defensive technique while Chaz/Rolf's is an offensive one. So, the only way to distinguish them is "Grantz (offensive)" and "Grantz (defensive)". While Grantz (offensive) send an energy attack to the enemy, like an hadouken or kamehame, Grantz (defensive) performs a very similar technique (if not the same) of the sword Elsydeon (basically it creates a magic barrier around the party and escapes from danger using some kind of teleport). Note2: There are a lot of differences in PS1, PS2, PS3 and PS4 (between JP and US ver), but all of Magic spells and Techniques have the same Japanese name in all games. Last edited by newsblade on Tue Dec 18, '12, 7:30 pm, edited 8 times in total. NEWSBLADE : No problem ! I was saying that it wasnot easy to catch only because of my understanding skills ! That's not at all your "fault" !! But thanks for the precisions : that's great as before ! The matter of changing names is very hard to follow : and if you don't "speak" or don't have skills in reading japanese..tht's even harder !